Silk’s Post #98 — Okay, I have to admit it. I’ve been playing hooky from writing all summer and I need to get back on that horse, pronto. Like my 5writers friend Paula, I continue to live by an indelible mental calendar inherited from my school years. As I have a mild case of colour and spacial-sequence synesthesia, in my mind’s eye the “Summer Vacation” weeks between the end of June and Labour Day appear as a big, sunny, yellow arc in the circle of each year. It was years before I realized that other people didn’t envision and understand the calendar this way. Wasn’t it obvious to everyone that July and August are supposed to be designated exclusively for playtime? Apparently not, as I learned all too well during my workaday years of mid-adulthood. Now that I’m “retired” from my first career (in which the year was expected to have 12 months, not 10), my summer calendar has reasserted itself. I, too, have been more or less goofing off for the past couple of months – at least when it comes to writing productivity. But now, as I gaze longingly out my study window at the still-bright sunshine and the splash of carmine geraniums spilling from my hanging baskets, I know the time has come to get back in the saddle. Like a reluctant kid who doesn’t want to trade sand-between-the-toes for that stiff new pair of back-to-school shoes, I’m resisting. How to make a re-dedication to writing more appealing? More fun? More enticing? I know I feel exhilarated when I’m in the groove, so what’s the hold-up? I shouldn’t have to negotiate with myself to get back to doing what I love. And I don’t want writing to become another item on an already way-too-long “to do” list. Maybe this is the problem: after a couple of months of following the path of least resistance, facing the prospect of buckling down to the business of writing feels complicated, challenging, and suspiciously like Work! as Maynard G. Krebs used to exclaim with a shudder. Maybe those simpler times, when TV only had 12 channels, can offer something instructive. Maybe the complexity of our sophisticated, privileged and “enlightened” times – from the technology we wrestle with, to the crammed social calendars we juggle, to the extravagant mobility that keeps us constantly hopping, to the monumental effort we put into maintaining our lifestyles and our toys – I mean, maybe a little de-cluttering is in order. A little unburdening of expectations. A little going with the flow. A little simple wisdom from a more innocent age to help get things rolling along. 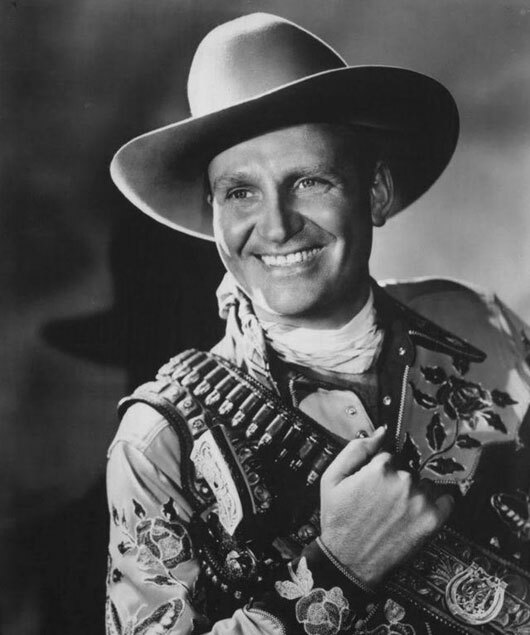 And no one rolled along, back in the day, with more homespun grace than my favourite singing cowboy, Gene Autry. He was the role model that I used to watch on our first, 10-inch-screen, black & white TV in the early 1950s. Like every other kid my age, I loved cowboys, and especially Gene with his white hat and his horse Champion. He was also the proud author of the unambiguously upright “Cowboy Code”, where Rule #1 is “The Cowboy must never shoot first, hit a smaller man, or take unfair advantage” (ah, those were the days). He’s the only person to have five stars on the Hollywood Walk of Fame, one each for motion pictures, radio, recording, television and live theatre. And his recording of “Rudolph the Red Nosed Reindeer” is still the definitive version. In other words, he was the real deal. This entry was posted in Completing a Novel, Productivity and tagged Back in the Saddle Again, Gene Autry, simplifying, summer vacation by Silk Questo. Bookmark the permalink. “Head em up, move em out! Rollin, rollin, rollin, keep those doggies rollin Rawhide! (I prefer Clint Eastwood’s earlier days but either way, it is time. Bon writing Silk. Thanks Ohio! I was also partial to Roy Rogers and Hopalong Cassidy and the Cisco Kid … and my top favourite was Annie Oakley, of course. Different times for sure. For me, all latter day cowboys will forever be eclipsed by Maverick and the incomparable James Garner. Happy writing again, Silk – though it’ll be a challenge with all those ripe peaches, not to mention apples ripening. Loved your cowboys!